PLEASE TAKE NOTE! A NEW, REVISED AND UPDATED VERSION OF THIS BOOK IS NOW AVAILABLE! This unique book is a comprehensive guide to using SketchUp as a tool for designing furniture, cabinets and other woodworking projects. It comes on a disc and is in enhanced Adobe PDF format. Within the 184 pages of text are 49 short videos that reinforce the lessons. It’s easy to search and find exactly what you’re looking for. This video preview of Woodworker’s Guide to SketchUp demonstrates the enhanced features of this book. The combination of text and video makes learning (and reviewing what you learned) a simple process. Written from a woodworker’s perspective, it doesn’t show you how to layout a roof, or place a building in Google Earth. It does show you simple, proven methods to model detailed projects in a few simple steps, and how to use a model to make your time in the shop easier and more efficient. Woodworker’s Guide to SketchUp is available directly from the author for $39.95, with free shipping to all US addresses. THE ORIGINAL VERSION OF “WOODWORKER’S GUIDE TO SKETCHUP IS NO LONGER AVAILABLE! Scroll to the bottom of the page if you live outside the United States to purchase this book via download. If you live outside the United States and want to purchase this book on disc, we ship this digital book on a disc via US Mail as a First Class Package. Our cost for the stamp is currently $6.55, and we ship around the world on a regular basis. The cost for postage has gone up recently so we can no longer ship internationally for free. I would like to know if you plan to update Woodworkers Sketchup to version 8 in the near future and if so when? Thank you for your time and attention to this request. 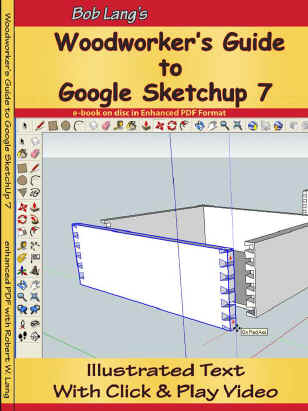 I’m interested in your sketchup book and I’m wondering if I can download it in electronic format rather than posting as I live in New Zealand. What is the difference between this book and the “Shop Class on Demand” version that you authored for Pop Woodworking? Hi Bob, Are you going to offer a sale this year for Fellow Lumberjocks? Like that sale for 29 dollars? Just cking. Looks like alot of positive reviews for you cd. is it still valid with the new SU version? Yes, there haven’t been that many changes to the SketchUp software since “Woodworker’s Guide to SketchUp” was published. i can not run the vido . due you have eney pointers. The download link will work a few times. Try again, if it doesn’t work, send me an e-mail and I’ll hook you up.